One cannot these days escape the slogan of the Trump campaign: “Make America Great Again.” Set aside GDP, living standards, and hard-power abroad, America was “made great” in the first place by simplifying stories and creating uncomplicated narratives of greatness – not necessarily by actual achievements. It was made great in large measure, too, through the erasure of competing stories, by the unmaking of others. The team of McDougall, Philips, and Boxberger explains that these tasks belong to state-makers … and they are not necessarily who you think. 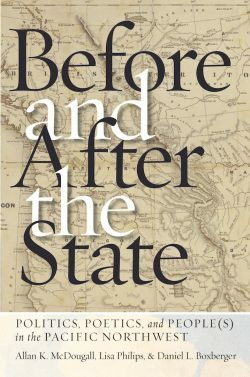 Before and After the State mainly focusses on the Oregon and Washington Territories and early British Columbia in the nineteenth century, asking “How does a state take root in a territory previously free of boundaries?” (p. 2). The authors — two professors emerita (Western Ontario and the University of Alberta) and a third active at Western Washington — come to this question from the fields of Political Science and Anthropology. 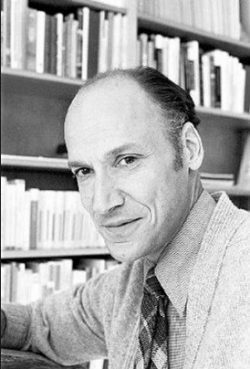 I am cautiously pessimistic when it comes to histories written by social scientists: too often social theory gets in the way of sound historical analysis. An epigram from Gramsci or Foucault can be enough to make me close a book and staple its pages shut for good. This collection, however, repays persistence. Now, this is meant to be a study of state making on both sides of the 49th parallel but, truth be told, it’s more about the American version. America made the Oregon Territory American by telling stories that obliterated alternatives. American missionaries focused on the souls of American settlers, ignoring both the Indigenous communities and British North American Catholics (Indigenous, Canadien, or otherwise) (pp. 95, 130). Local Indigenous, British, Canadien, Iroquoian, Abenaki, Kanaka, and Métis stories of commerce, settlement, parenthood, and trade in the first half of the nineteenth century and earlier were written out of existence. The American settler society regime ca. 1850 (which “had been raised on a world view that defined the British as the enemy, the Hudson’s Bay company as an evil monopoly, and westward expansion of the United States of America as sanctioned by God”) took the first steps; subsequently organizations like the Oregon Historical Society did a retroactive and systematic job (pp. 102,137). The right to citizenship and thus to vote was denied to African-Americans, non-Americans, almost everyone with a smattering of Indigenous ancestry, and Hawaiians (p. 144). By way of examples, John and Marguerite McLoughlin loom large and the region’s greatest renaissance man, Ranald Macdonald, deservedly gets a chapter of his own. All three racked up accomplishments that were dismissed by American settler society (led by the “Mission Party”), which characterized anyone who wasn’t American as an interloper or fraud. The McLoughlins and Macdonald pursued strategies that they thought would lend them a degree of inclusion, but if nationality (the taint of British- and Canadian-ness) didn’t squeeze them out, then race would. Macdonald was the grandson of Concomly, the “King of the Columbia,” a title he wore with pride but which won him American condescension (pp. 160-78). Marguerite Waddens McKay McLoughlin was half Cree, so that didn’t work in her favour; John McLoughlin – married, thus, to a woman who was regarded as not 100 percent “white” — was similarly treated badly. In nineteenth century Oregon these categories were loose threads in the fabric of the emergent citizenship: they had to be snipped off or, in the case of the McLoughlins, whitewashed away. Remarkably, virtually all of these barriers were put in place over a matter of one or two years. When McDougall writes that “the mantra of the new politics did not have room for moderates,” the question is begged: were the American settlers therefore extremists? James and Amelia Douglas together spent important years in the Columbia Department. Boxberger speculates that James elected to resettle at Fort Victoria in 1849 because his Afro-Caribbean ancestry would put him at a significant disadvantage in stridently anti-black Oregon (p. 108). 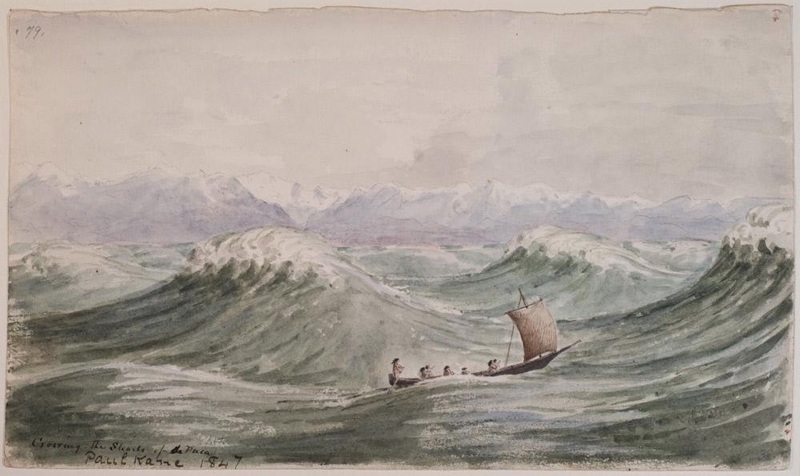 The Douglases took some of the lessons of the Americanization of the Columbia Valley with them to Vancouver Island and Boxberger concludes that their inclusive, multi-ethnic vision of colonialism was an outcome. Not all early British Columbians took the same lessons. 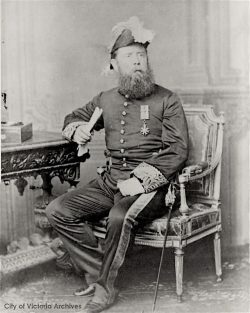 Joseph Trutch, known north of the 49th for his racist approach to relations with Indigenous people and for reducing reserves to fractions of what they had been under the Douglas regime, built up a close and approving relationship with the American community in Oregon. 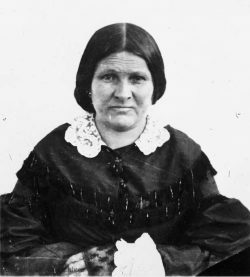 Originally from England, Trutch spent nine years in Oregon in the “formative” 1850s, during which time he married a woman from Illinois and despised the Indigenous people (pp. 123-4). During Trutch’s Oregonian years, the settler frontier banned African-Americans and marginalized Indigenous peoples (when vigilantes weren’t hunting them down). 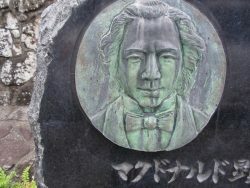 Trutch brought those values to B.C., and they may well have been the philosophical source of his hostility toward Indigenous people, Asians, and African-descendants. The border might have worked against nationalities but it was a poor obstacle to ideas. Are the two state systems massively different, at the end of the day? McDougall makes the point that — post-Douglas, after 1864 — British Columbia moves toward “settler exclusivity” that resembles Oregon, “but with hierarchical smugness rather than evangelical fervor” (p. 146). I can’t help but think that the implications of this very smart observation are worth further examination. Boxberger observes that narratives that undermined what was left of Douglas’s tradition of (modest) tolerance were rapidly introduced from Old Canada after 1871: the new province “came to follow a path of social change scripted elsewhere” (p. 134). Philips identifies an enduring meta-narrative in B.C. that is “top-down” rather than “bottom-up:” the state is created through British legislation and intervention rather than the presence and activity of “settlers” (pp. 219-20) This is, of course, a bit of a chestnut, one that has been used by generations of commentators and scholars to explain the apparent peacefulness of the entire Canadian West in contrast with the turmoil and terror of the American West. In B.C., however, historians such as Tina Loo and Cole Harris have detailed various ways in which settler society vouchsafed those state activities, sometimes through violence. There are profound weaknesses to this collection, including historical errors and laziness. 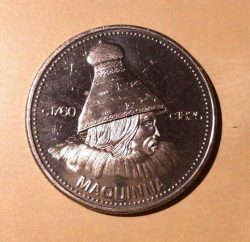 The “local chief” at Yuquot has a name: Maquinna (p. 18). Please use it. Ditto the “local natives” at the mouth of the Columbia (p. 27). William Fraser Tolmie is “credited with giving the region’s Native Americans their first formal religious instruction,” a comment that could do with some critical rethinking (p. 119). The prose is, in places, leaden: “If one compares their assertions with the latitude of interpretation surrounding cross-cultural interactions, the gulf between the statist system and life in the Northwest becomes apparent” (pp. 18-19). The text needs more maps. Philips makes declarative assertions about B.C. historiography that demand examples (p. 231). And while the Oregon Historical Association’s work is scrutinized, there’s strangely no parallel examination of the impact of the BC Historical Society over its first sixty years. This is, I think, an obvious opportunity for comparison of the two organizations as state-making agencies. 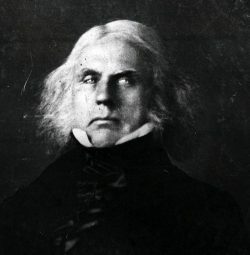 Philips describes the ways in which “pioneer” status in Oregon was both sought after and disputed: who and which generation would qualify? (pp. 211-12). 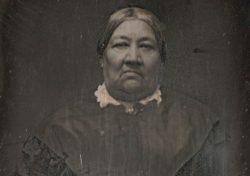 In British Columbia a similar fetish arose in the late nineteenth century which, enduring through the hundred years that followed, positioned “pioneer women” in particular as racially “pure” insofar as they were not of native descent (pp. 215-17). Unfortunately and once again, an aspect of the mirror dimension of British Columbia is not fully probed. The power of talismanic artifacts in the creation of an “American” legitimacy in the Oregon Territory — bits of the Mayflower, fragments of revolutionary objects and monuments, even bricks from Independence Hall in Philadelphia — begs the question: do similar (albeit Canadian) objects exist in British Columbia? This is something to take up with other historians over beer, although I wish some effort had been made in this volume first. Overall, the authors do not sufficiently engage with Canadian scholarship. In one footnote the “excellent literature on the Nootka Conventions” lists three sources, published in 1925, 1929, and 1955 (p. 258, fn 20). That’s a bit stale. The contributions of Harris and Loo to this field are effectively ignored. But of all the peoples erased in these pages no one is more completely and unjustifiably vanished than Jean Barman. How a study on this topic could be conceived, let alone written and published, without a clear reference to and discussion of her work defies explanation. 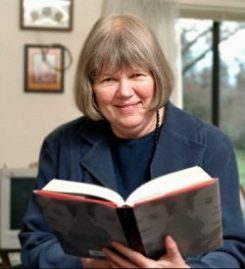 Barman’s influence on British Columbian historical research is familiar to every reader of the Ormsby Review and most will know, as well, her forays into the history of the early settler experience on the lower Columbia. Boxberger complains that histories of fur trade society in the 1990s advanced a view in which “community and family” became the standard, “except in the Pacific Northwest” (p. 32). He provides two footnotes to that passage, but nothing about Barman. Words simply fail me. The book ends on a poetic note, which is to say a review of the various media through which the histories of the Oregon Trail and the Canadian Pacific Railway — rough equivalents as umbilical cords between the nation-state and the “frontier” — have been delivered. Video games and popular songs take the stage. This would stand as a fruitful and engaging study in the larger collection were it not the concluding chapter. It’s an odd way to end what otherwise presents as a thematically unified package. Clunk.